Afterlife with Archie is back! The game-changing title that spawned it's own imprint at Archie Comics has returned with another eloquently told horror story. Archie and the rest of the survivors are snowbound in an old hotel as they contemplate what to do next in the wake of Jason Blossom's grisly demise. A somber Archie confides in an old friend while the adults spin a tale of their own. When we last left Riverdale's remaining survivors, Betty provided the narrative through her journal entries. It was a quiet but thoughtful endeavor that led to a shocking conclusion. The uncomfortably close siblings Cheryl and Jason Blossom separated themselves away from the group and were immediately in danger. Jason was dead and some blame Cheryl. It's a divisive topic that could tear the survivors apart. The narrative in 'A Ghost Story,' comes from Archie's bittersweet conversation with his pal, Jughead. The ghost of Jughead is our surrogate as Archie tells him the status of the group and catches him up on where they are now. Roberto Aguirre-Sacasa does a great job of capturing what Jughead meant to Archie as he confides in him. Jughead's funny, pop culture references and advice sweetly reminds us how vital he was to the gang and his absence is even more heartfelt. Aguirre-Sacasa has a knack not only for thrills, but he finds ways to humanize these legendary saccharin characters into three-dimensional sympathetic beings. We end up missing Jughead as much as Archie does. Things are getting heated as the discussion turns to what to do about Cheryl who is understandably sullen and in mourning. Meanwhile, Hiram Lodge and Mary Andrews reveal that a deal done long ago with the witches of Greendale may have cleared a path for the catastrophic situation they find themselves in now. 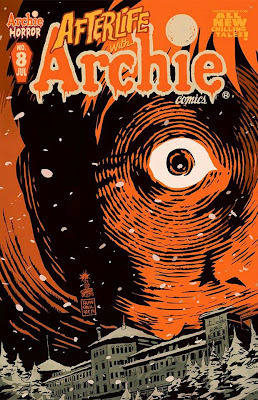 As usual, the look and feel of Afterlife with Archie is on the more than capable shoulders of the incredible Francesco Francavilla. He paints every scene in shadows with a limited palette that gives the series its signature look. The blues and oranges jump off the page especially Archie's red head. If there is an artist more suited to bring an atmosphere of danger, anxiety, and tension more than Francavilla I haven't met him/her yet. Francavilla and Aguirre-Sacasa are a dream team. To say nothing happens in issue eight would be disingenuous. In the best horror stories, the suspense doesn't always come from the monsters at the door but from the human drama between those struggling to keep it together amid the chaos. Afterlife with Archie is not interested in cheap thrills. Everything is earned and character development is job one. It's the bar Archie Comics has placed on this new imprint and the creative team excels on every facet. Afterlife with Archie is worth the investment. Dive in and follow one of best comic books to come along in a long time.